I nearly forgot to write a review of this book on my blog. When I first heard about this book, one of my friends was raving about it. And then I saw another amazing review …and another … and another. You get the point. Everyone who reads this loves it. The same was true for me. 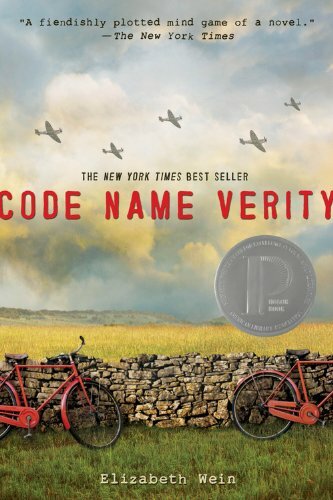 This book is set during World War II and follows two best friends, a pilot and a spy. Their code names were Kittyhawk and Verity. During a flight into Nazi-occupied France, they crash and Verity is later captured while trying to complete her mission. The book is divided into two parts. The first part is from Verity’s point of view in Nazi captivity at a French hotel. She has been told to write down everything she knows, so she writes from Kittyhawk’s learning to fly all the way to the crash in France. The second section is from Kittyhawk’s point of view as she is trapped in France and trying to rescue Verity. I love historical fiction. This would’ve been a quick read if I could’ve just sat down and read non stop. This is definitely one of those books that you’ll read late into the night. The plot twists were great. In fact, it took me a while to realize that maybe Verity wasn’t entirely truthful in her account of what happened. The sequel, Rose Under Fire, came out a couple years ago and I will be reading that soon! Like everyone who read it before me, I’ve been trying to recommend it to anyone who enjoys reading.